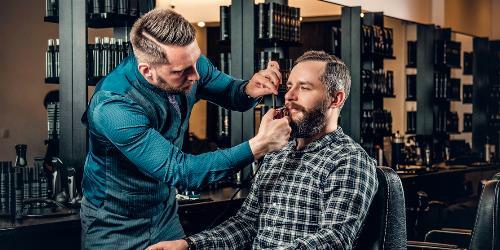 When it’s time to set up trash pickup service for your business there are a few decisions you’ll need to make aside from which company you’ll work with. The first step in that process is all about the location. The amount of space you’ll need for your commercial garbage dumpster depends on the size of the container you select. But you’ll also need to factor in extra room to accommodate the delivery truck. 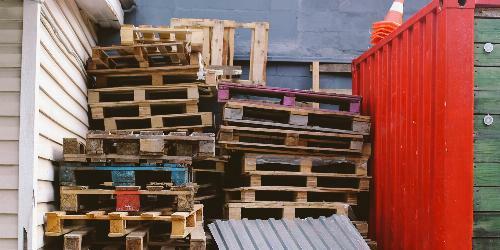 To help you pick the best location for your dumpster, we’ve outlined the details here. How Big Is the Average Commercial Dumpster? First, you need to select a dumpster size. Whether you own a business or oversee a large organization, it’s important to find the right size dumpster to handle your waste stream and fit comfortably on your property. Dumpsters.com provides 2, 4, 6 and 8 cubic yard permanent dumpsters to manage waste from restaurants, retail stores, schools and more. Dimensions for these bins range between 3-6 feet wide and 3-7 feet tall. 4 Yard 6 ft. x 4.5 ft. x 4 ft.
6 Yard 5 ft. x 6 ft. x 6 ft.
*Exterior dumpster dimensions may vary by manufacturer, but the total volume is accurate. How Much Room Does the Delivery Truck Need to Maneuver? After you select the size of your commercial container, it’s time to pick a home. 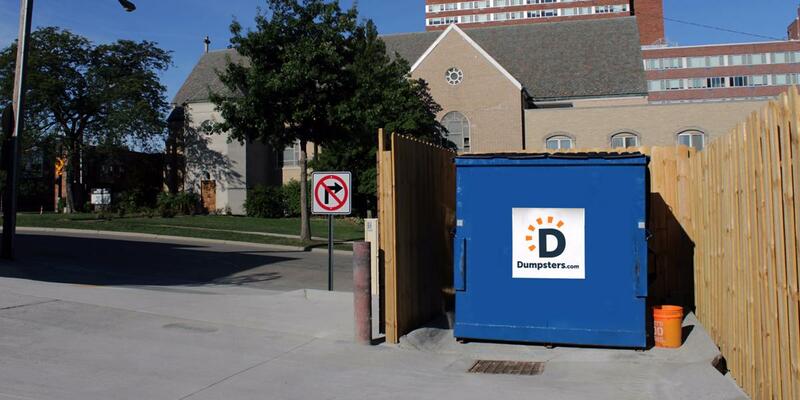 It’s essential to keep your permanent dumpster clear and accessible at all times. Choose an area free of hanging wires, tree limbs or other obstructions that might block our truck’s access. Also, double check that your dumpster can be reached by employees and won’t obstruct traffic. 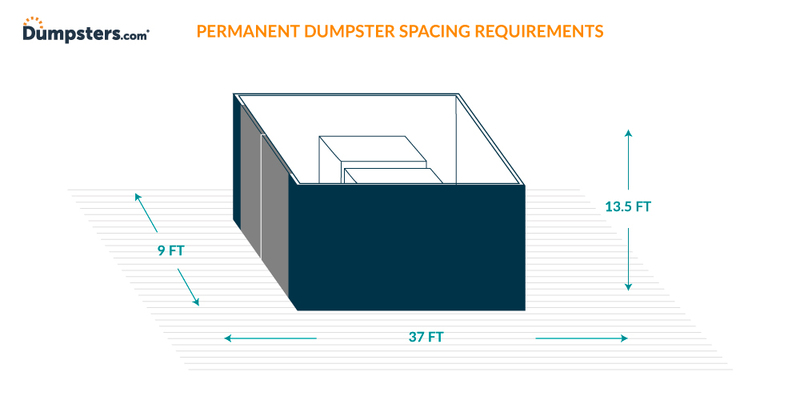 The visual below shows general spacing requirements, including enough room for a dumpster enclosure. In addition to the space needed for the dumpster, you’ll need to allow enough clearance for pickup and delivery. Our delivery drivers offer these general spacing recommendations to ensure proper clearance for the vehicle to lift and turn. 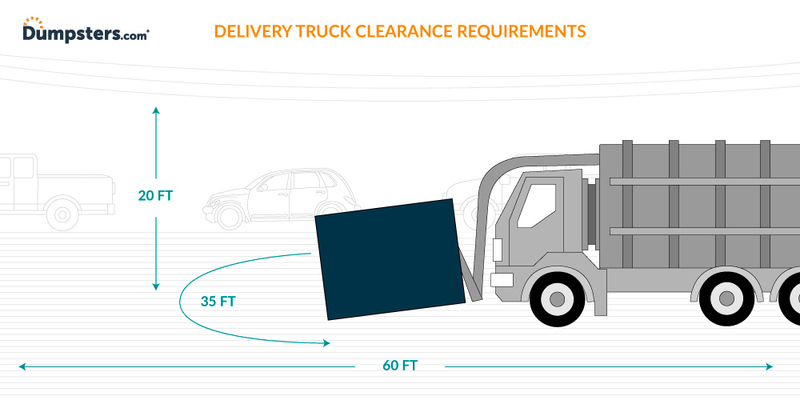 Use the graphic below for dumpster truck clearance requirements and general dimensions. Once they know the necessary spacing, many businesses choose to build a dumpster enclosure, or corral, to house their container, especially if it will sit away from the main building. Not only does this make your trash less visible to customers, it also prevents other people from using your dumpster. The area within the enclosure, or the dumpster pad, is typically constructed with reinforced concrete to support the weight of your dumpster without cracking. Always remember to unlock the enclosure on pickup day. This way the truck driver can empty your dumpster and you won’t be charged a trip fee. For gated locations or areas with restricted entry, it may be a good idea to give the driver a key or gate code so they can easily access the area. Make sure that your enclosure is a minimum of 14 feet wide by 19 feet deep for both small and large dumpsters. At a minimum, the dumpster pad should be 6-inches thick and made of 3,000 pounds per square inch, steel-reinforced concrete. The right weight tolerance is important to prevent cracks. An apron should extend four feet in front of the gate, with the top of the pad at ground level. This helps prevent cracks from the weight of the delivery vehicle and reduces the risk of injury. Planning to build your corral yourself? Check out our in-depth guide to constructing a dumpster enclosure. Do You Have to Have a Concrete Pad for a Dumpster Enclosure? A dumpster pad is not required. However, it can help prevent wear on your parking lot from the weight of the container. Over time, one crack can spread to the rest of your lot, especially in areas with fluctuating climates. A concrete dumpster pad can help prevent the need for costly repairs down the road and eliminate safety risks for customers and employees. You’re Ready to Set Up Commercial Dumpster Service! Keep these tips in mind to find the right spot for your container and streamline your commercial dumpster delivery. If you have other questions or need clarification on anything, we’re just a quick call away.